Case Study: @SuperSpeedGolf Training System. Can it help you swing faster? 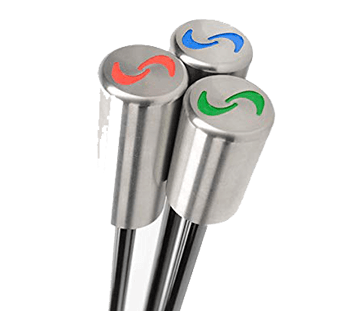 The SuperSpeed Golf Training System helps players increase swing speed through a concept called OverSpeedTraining. Coined by the SuperSpeed Team in 2014, OverSpeed Training resets the normal reaction speed of a learned motor pattern to something faster. This works by first reducing the weight of the golf club, therefore allowing the player to create a faster than normal golf swing. The brain “remembers” this faster speed as the training progresses through the three training clubs, which gradually increase in weight. For example, a player that is starting at a swing speed of 100 MPH will be able to swing the light club (green) at about 118-120 MPH on average. The player will then move to the medium club (blue). Because the player just produced the 118-120 MPH swing with the green club, the brain remembers the speed of this neuromuscular reaction. With the blue club, that same player will swing at about 115 MPH on average. Then, the player will move to the heavy club (Red), which is 5% heavier than their driver. Because of this speed reset, the player will swing this club at about 110-112 MPH on average. That is much faster than their normal swing speed of 100 MPH. Once the player goes back to hitting balls, adding back in the skill element of the sport, they will see an increase to about 105 MPH. With continued practice, this will become a permanent increase in swing speed. 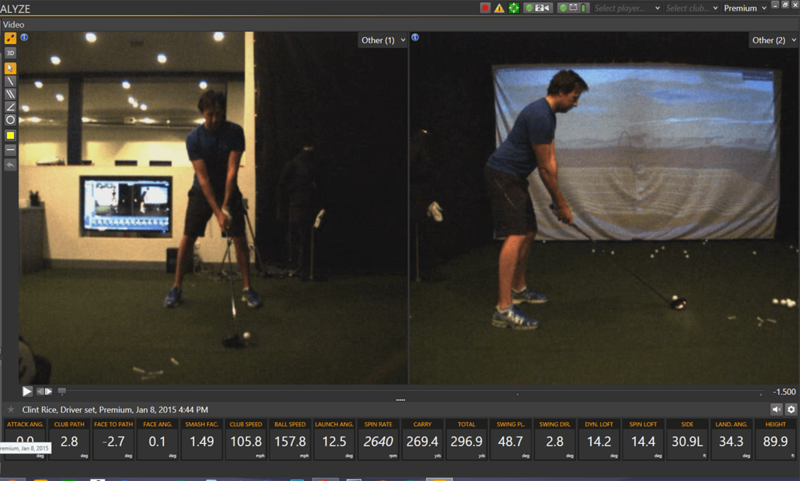 While most training aid companies talk a good game, SuperSpeed is one of the few that has been able to provide real data to show that its product works. Background: Clint began working with SuperSpeed in January of 2015. 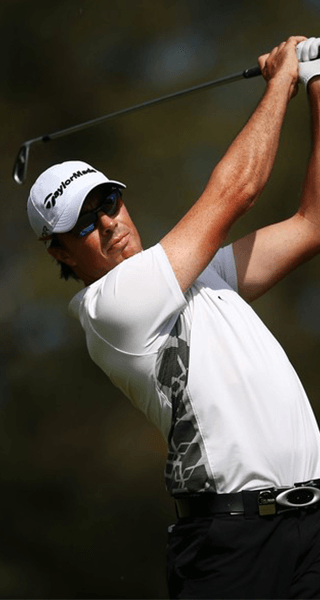 He had been working with a top coach in Australia for several years with the goal of increasing swing speed. In a 3-year period, he increased clubhead speed through intense gym work and mechanical improvement from an average of 104.5 to 106. Clint was fairly happy with these results. Swing Characteristics: Overall solid fundamental mechanics. He tended to early extend slightly during the backswing and remain stable with this motion through the downswing and impact. He tended to hinge the club fairly early in the backswing and not create much increase in lag during the transition. Biomechanics: Clint had good overall patterning to the kinematic sequence. His peak speeds in all segments were significantly below the tour average. He had a significant amount of downswing loading between the pelvis and the torso, but very little between the Torso and distal segments. He also had a significant deceleration variant in the Torso segment and a very slow thorax rotational peak speed. The Kinematic Sequence has been studied for many years as it relates to the golf swing. The graphs below show the efficiency of energy transfer between the different segments of the golf swing. Generally, it looks at the pelvis, torso, lead arm, and club as the main segments of the Kinematic Sequence. As each segment begins to fire in the downswing, we see each follow a pattern of acceleration, peak, and deceleration. How fast each segment accelerates and decelerates, has a strong correlation to how much energy will transfer to the next segment in the chain. Basically, the steeper the line goes up represents acceleration, and the steeper it goes down represents deceleration. Notice the thorax deceleration variant and the large amount of downswing loading between the pelvis and the rest of the segments. We retested data in July of 2015. Here are the results after working with SuperSpeed golf for six months. We concluded from this retest data sample that Clint had improved the original deceleration variant and balanced out the segmental interaction of his sequence considerably. In fact, at this point, he was swinging the golf club around an average of 115 MPH, an increase from a 106 average in January. Changes seen in the Trackman data after Clint’s initial assessment were significant. He started with a club speed average of 105.8 and a maximum of 106.7 before undergoing a level 1 SuperSpeed Protocol. After the 15-minute training session with SuperSpeed, we immediately hit balls again and retested Trackman data. This was a single swing from the set. This was a pretty typical swing that Clint saw in competition. This swing was the very first one out of the gate after the SuperSpeed training. We saw an initial increase for Clint of 7 MPH in swing speed and 8.5 MPH in ball speed. 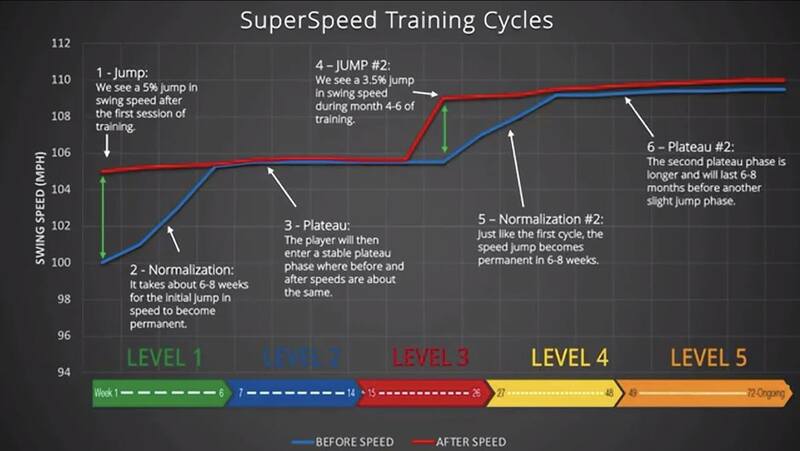 OverSpeed Training works in a series of phases. These include the Jump Phase, a gradual Normalization Phase, and a Plateau Phase. The jump tends to occur after the first session of training. If a player measured their swing speed before the training and then again immediately after the session, that player would see a Jump in speed of about 5% of their starting swing speed. This change is not permanent yet. The player must then go through about 6-8 weeks of regular training. This is the Normalization Phase. During this time the player’s swing speed before the training will gradually get faster and faster as it approaches the speed after the session in the initial Jump. Once the before and after speed are the same, the player has reached the first Plateau Phase. Once a player reaches this point, the increase in swing speed is permanent. Below is a chart illustrating this pattern. Clint’s current progress has shown continued improvement with club speed. Here is data from a recent Trackman session. This represents a little over a year of training with SuperSpeed Golf. As you can see, the club speed gains are significant. Clint has gained aproximately 13MPH since he started training with SuperSpeed. Have you tried SuperSpeed? We’d love to hear more about your experience with the system. The SuperSpeed training system is used by more than 350 Touring Professionals worldwide. For more information on how you can increase your clubhead speed, visit SuperSpeedGolf.com. I’ve been using the System since December and am now 7 weeks into protocol 1. I’m 64 years old, in good shape, and trying to get back some speed lost over the years. 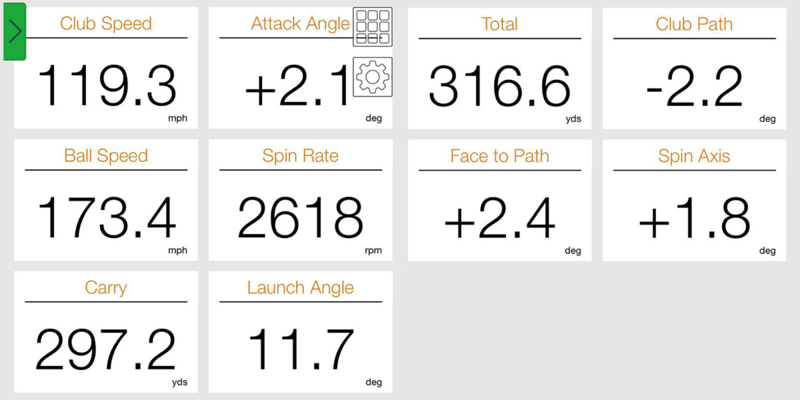 I started at 98-100MPH and after 8 weeks my driver swing speed is pretty consistent at 103-105. On a couple of “good” days, ( I assume my body was in the zone) I was swinging the driver at 106-110. I do feel this has helped, along with stretching, and looking forward to continuing the program. My goal is to get up to 110-112 on a consistent basis. Time, and practice, will tell. Hi.. I have access to Superspeed in a gym I visit one a week. I think I would benefit from buying them. Are they only available on-line or can they be purchased in a Golf Retail outlet? Hi JP, they are available in some smaller retail stores such as Worldwide Golf, Nevada Bobs, and Miles of Golf. Not in the major chains. They are also available on our website. My SS is around 101mph and I brought these to the sim the other night because I wanted to see what my buddy could swing them at who usually swings between 111-114mph on trackman. With the light stick he was getting 122mph and with the heavy stick around 116mph on my radar. I was able to get 138mph my fastest to date with the light stick and 122mph with the heavy. I’m thinking he would be faster with some more swings. Than I teed one up and I got 105mph on trackman and 110mph on the radar. Why is there such a big drop off from swinging the heavy to actually swinging my driver??? Is it air resistance or is my swing more sequenced with the sticks because I’m not trying to hit a ball??? Defiantly going to stick with it for now and see where this goes. I am very interested in the speed stick program and am considering it for my winter training. 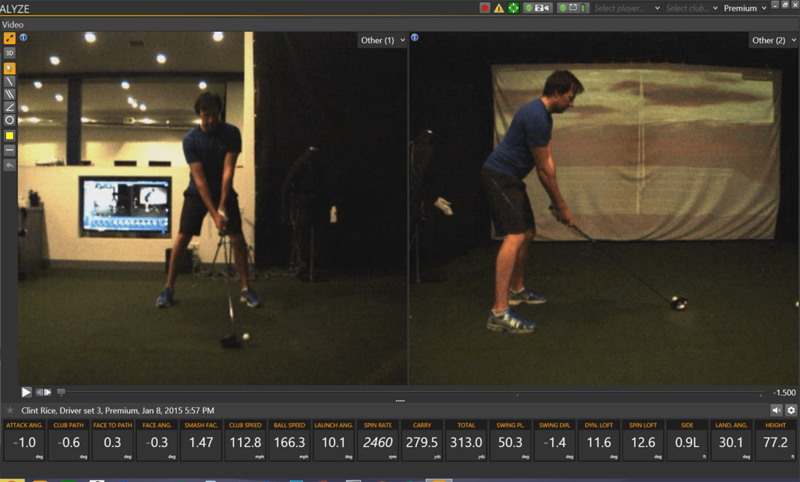 I have been using launch monitors, boditrak, and K-Vest on and off for the last 12 months — all amazing tech! So, I have a problem with your kinetic sequence ‘before/after’ graphs. The ‘after’ actually looks worse than the ‘before’. 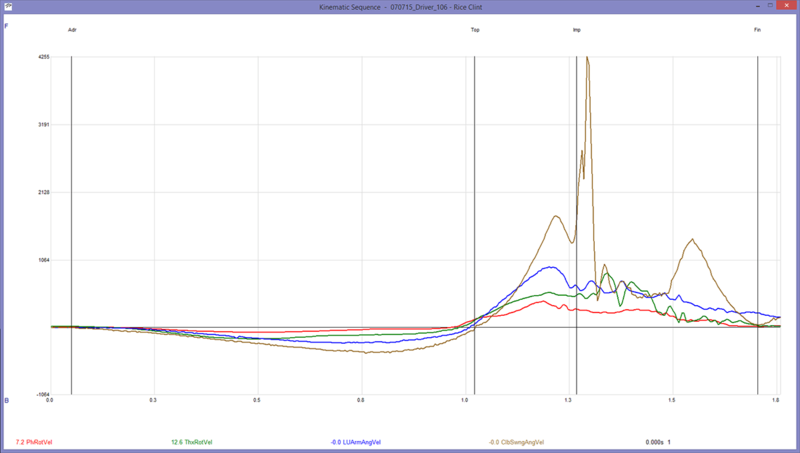 The first problem is that the scale is different between the two graphs — 2280 vs 4255 dps max on y-axis. So Clint’s top club speed on the kinetic graph is significantly faster overall, but not at impact. The second problem is that his 2000 dps increase comes after impact. So how much does it really contribute to ball speed and distance? Third, what is the dip in club speed prior to impact? Seems to me club speed should be constantly accelerating from the top of the backswing to impact, slight slowing at impact, then a little more acceleration just after impact. If Clint actually hit the ball with 3,000+ dps instead of 2,000 dps I think he would have significantly higher ball speeds and distance. A graph of body kinetics of a pro golfer would be a great comparison to see (just make sure it’s in the same scale). 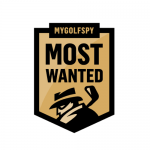 The article and reader comments were very interesting — a great read for a golf geek like me! Thanks for the great questions! We apologize that these graphs are not perfect. When measuring 3D, the actual moments for top of backswing, impact, etc, are just estimated by the TPI 3D software. These points are not always exact on the graph. They are pretty close to accurate on the before graph, but not accurate on the after graph. Impact is actually at the top of the first peak of the gold line, before the afterspike. This large after spike is actually where the sensor shifted suddenly after impact. It doesn’t represent anything about the actual golf swing. Clint’s rotational velocity of the club actually didn’t change that much in this period. Rotational velocity is a tricky subject, because it doesn’t always directly correlate to swing speed in MPH. There are many more factors. For example, in the before swings, Clint actually tried to generate speed more by the release of the club head. This actually caused an increase in rotational velocity of the club. In the later swings, although the swing speed was significantly faster in MPH, some swings had a reduction in rotational velocity as the bigger muscles of the body were generating a lot of the speed and there was less wrist involvement. The key improvements in the sequence are actually the amount of downswing loading that happens in the swing. Clint improved significantly in the acceleration/deceleration pattern in the thorax/pelvis, and the wrist club interactions compared to his earlier graph. There was also a significant acceleration variant in the thorax that improved in the after graph. These areas are representative of improvement for Clint’s efficiency. I know that it is not readily apparent in the graph. There is a lot more information on the Kinematic sequence and plenty of examples at http://www.mytpi.com. Thanks for the article. I would be open to try it but actually have a concern about swinging overweight clubs. I recently trained with an overweight club to train my tempo and injured my left elbow. I understand SS training doesn’t involve impact but would it be ok to use it with a mild elbow inflammation? My driver speed is around 106, I just started golf again after years off it. Hi Steph, our clubs are 20% lighter than driver, 10% lighter and 5% heavy. So our heaviest club is barely heavier than the driver which shouldn’t cause and issue for you. What do you mean? We don’t pay Martin to endorse SuperSpeed. Curious why it uses cylindrical weights instead of shaping the head of the training aid like a driver. We want to promote speed away from the skill elements of the golf swing. This helps players break through athletic barriers. Our research about hitting balls vs. not hitting balls during this type of training was quite definitive. When hitting balls, the more elite the player from a skill standpoint, the less gain that player got while hitting a ball. Novice players got better gains. We attribute this to how ingrained the skill based elements of the swing are when an elite player has the goal of hitting a golf ball. Therefore, we wanted to make this a completely separate training from working on the skills of face control. It definitely works. I’m scratch and had 108 chs. I got up to 117 with the training in just a few weeks. However, in my case, I became flippy. I found I couldn’t maintain my drive and hold golf swing that was mainly pivot driven. I developed way too much flip/roll release to generate the speed. So I stopped the training bc my accuracy fell off badly. I need to eventually attempt the training with a focus on both technique and swinging as fast as possible. But I imagine that is hard to do. If you are a flipper already, then I’d highly recommend. It is very important when you gain speed quickly like you did in your case to also make sure that your body can support and stabilize this new speed. In your case, we would test your grip strength. Research shows that most tour players have significantly stronger grip force than most amateur players. This doesn’t mean that they grip harder, just that their potential for grip strength is greater. For example a tour player may average somewhere in the 55-60 PSI range when tested for max with a golf grip sized dynamometer. Most amateurs will test for a max around 30 PSI. We find tour players usually grip with about 50% of their max (this changes throughout different parts of the swing), so their effective grip strength is about 25-30 PSI. Most amateurs cannot maintain this as it is near their max potential. We would recommend testing and working on this to improve your ability to control the club at impact with the higher swing speed. Used the SuperSpeed and followed the training protocol strictly for about two months. My swing speed definitely increased. A good hit of my driver goes 10-15 yards further. However, the biggest problem is it will break your tempo and rhythm since you will try to swing and hit as hard as possible. I drive the ball further on good contacts, but my bad contacts also increase dramatically. By the end of day, my score suffers. Other people may have different experiences, but I am selling my SuperSpeed since consistency, accuracy and decent distance are more important to my game. Swing faster only helps when you put the ball in the middle of the club face and stay in play. How much and where do you live? Hi Leon, sorry to hear that you are having a bit of issue with consistency. Tempo is certainly important to a consistent golf swing. However, we have seen with amateurs and tour players all over the word that in order to maximize both power and consistency, many players may need to adjust their current tempo slightly. The skill side of an adjustment like this can take a little bit of time to catch up to the increased swing speed. Once you get used to the new tempo, we tend to see that both your power and accuracy will improve even more. We only see this situation commonly with players who have more of a “backswing loading” type move in the golf swing. These players that tend to load the segments of their swing during the backswing, sometimes take additional time at the top with a slight pause and then the lower body doesn’t tend to initiate the downswing as we see as a common model with tour players. We hope you continue the training. We think that with a little bit more time you will see both your distance and accuracy improve with the improved sequencing and tempo. Curious, because I used this as a training aid in a session at Urban Golf Performance here in LA. It was good, but hearing people about tempo, would this couple well with the Orange Whip or products similar to it? Hi Andrew, the orange whip would be a complimentary product to superspeed. We’ve primarily seen it used as a tool to learn to sequence the lower body first in the downswing and also hear people mention improved tempo. Thanks SuperSpeed. As a non-product review, if your responses to this thread here is any indication to your customer service, it is good! I have started to use SuperSpeed and am 4 weeks into the first level. At first I did get on the course and felt like I just wanted to let rip aggressively like I am with the sticks. However, I soon settled down to relax the back swing a little and have definitely developed extra speed swinging through. I am concentrating on stability and swinging aggressively in the training and that seems to work for me. I have seen some great drives, commented on by friends and have beaten handicap in 2019 consistently more than at any other time, Its definitely helping me move better (58 year old) Roll on summer!! Interesting article.. Have tried several programs with minimal results. “May” look into this. None of this so-called information is new. It stands to reason if you swing something lighter it will travel faster than a heavier weight. Years ago “light” golf clubs – way, way below say the standard D2 swingweight – were marketed and where are they now? Gone bust. The same as this company will have done very soon. Just to be clear, we don’t actually manufacture light weight golf clubs. Our training system works with both lighter and heavier training clubs in order to reset the neuromuscular reaction speed of the body during the golf swing. This type of training has been done in sports for hundreds of years including track and field sports, and more recently major league baseball. We adapted the concepts to apply this training to swinging sports such as the golf swing. Also, our clubs alter the overall weight of the club. There is a slight difference in swing weight as well, as a heavier swing weight (which all of our clubs have) results in a tendency for more aggressive loading of the club during transition. This promotes better kinematics and lag. On a side note, we do agree with you about significantly lighter golf clubs or those which create lighter swing weights. These tend to work for a very small population of golfers. Most players will find more success with more traditionally weighted and swing weighted clubs. I bought the Superspeed system following the article on here in July, now unlike the majority of feedback I really do need additional clubhead speed, with a starting driver swing speed of 75 mph! So the bad news ten weeks of level one training and I gain 3 yards of carry and this comes from more consistent contact rather than any increase in clubhead speed. I contacted Superspeed and explained my findings, they asked for some videos of my exercises and asked a few quests, then provided a potential source of the speed leak and recommended I follow a different protocol for the next few months. It’s nice that a company stands behind their product with this level of support. Obviously I won’t know if the changes will make any difference but at least I have the motivation to continue the program over the winter, hopefully there will be some additional distance ready for next season. Make no mistake, this system required a significant commitment on behalf of the user, this is no easy quick fix. Impressed with that level of CS. Swing speed training is great if your swing is correct (swingpath/clubface attitude). If not you just hit the ball further OB. I’ve been working on technology for several years called “EvolSwing” that trains golfers to swing along the correct path unique to them (programmable and changeable user input) that also trains correct clubface attitude throughout the swing. No widgets or physically connected contraptions. Our company worked with Iowa State University’s department’s of mechanical engineering and kinesiology including physicists who are really rocket scientists. They did the hardware and software work but the kinesiology PhD’s did some very interesting research on how the human brain accepts input training. We then brought in a PhD from Princeton in Cognitive Brain Studies who incidentally isn’t a golfer but applied brain study theories to our project. When I tell people the golf training industry needs to be flipped upside down I usually get blank stares. Kinesiologists working in the medical rehabilitation field with Parkinson’s and brain stroke patients don’t retrain using methodologies commonly found in golf training. But the golf industry is so ingrained in “how Dad taught me and how his Dad taught him” that even new golf tech is geared to the same linear thought process. Simply put, 90-95% of great golfers all have very similar swings. Why? Do you suppose it’s because they all keep their right tucked in or their left knee in a certain place? Golf teachers have been championing “body position” tips for over 150 years and while helpful they all reason the cause and effect in reverse importance. That is “if you get your hands or arms or shoulders or whatever into this place you will have this result”. While true (and this is where the brain study and kinesiology folks come in) the brain overloads and cannot process all the hundreds of command inputs typical golf training implores. In short your brain implodes and this is why Golf has trouble attracting new players and keeping them. The one stat I’ve never seen is the percentage of golfers who stick it out after taking up the game? The reverse thinking essential for a correct golf swing is to think about “where the clubface is throughout the swing” i.e. is the club traveling along the right path and is it square to the target line. If you could do a “Blue Screen” of Tiger’s swing like in a CGI movie and only showed his clubhead moving it would be very similar to Justin Thomas’s and virtually most every professional golfer. There are exceptions certainly (those who play a fade or draw) like Jim Furyk but the essential here is the importance of the clubface vs the importance of where your knee or elbow are. But if you took a professional lesson today or read a golf tip it most usually will talk about some body position secret you need to learn. The problem is our brain learning a new swing tip is like playing “Whack-a-Mole” in that we attempt to learn one thing while retaining previous golf swing ideas in our head. Now you may wonder how EvolSwing get around this conundrum and I could tell you but you’d need to sign an NDA. Since I came up with this concept I’ve self trained and it’s possible. It works. But once the technology piece is done the process will be infinitely easier and years faster. Jerry, correct me if I’m wrong but you were talking about this 7 years ago and I still haven’t seen anything on it. You are correct. And counting. We’ve gone down several blind alley’s and partnered with engineering companies with some mixed results. We haven’t gone to market because the tech is still not where we want it. I’ve been using the Superspeed system for 18 months – 52 year old, 0 hcp, full time job, family etc… started at 97 mph swing speed and now up to 108 mph. Pickup at least 20 yards and hit it straighter. Agree with the great “workout” comment as well. The system works -only thing I’ve tried that gives you long lasting and measurable results. If you purchase – you’ll also need the speed radar to help gauge your progress. Certainly worth the investment. The mind thinks fast, but as Arnie, Jack, and Nancy said ” the body does not want to cooperate. Old is not just a feeling, it is real. Years ago when I was competing with Wood and steel shafts I had a swing speed of 108. Jerry Barber was making a “Driver” that was 40 inches long and weighed 42oz. The average Driver was about 12 to 13 oz in those days. I increased my speed to 115 by swinging that thing every day. The reason it was 40 inches long was so Tour Players could swing it in their room without hitting the ceiling. It works. Overspeed training is the only thing that has worked for us with students who have learned to swing slowly. Trust me the worst thing you can do to a child 1st learning to golf is to tell them to slow down through the impact zone. It is next to impossible to get people to speed up later. Flipping the club over and swinging the handle has been a staple drill for good reason forever. This just builds on that concept. The fact it can and should be done at home makes it even more valuable. Before I made the purchase my swing speed, based on the simulator I regularly use, was around 116.5. I broke 118 once in the 15-swing sample the day before the swing sticks arrive. After just two SuperSpeed sessions I went back to the simulator and my average speed was over 118, just a tick below 119. Every few swings I’d be over 120. I’m now about 4 weeks into it and almost half of my swings are registering 119+ swing speed with a good quarter or more above 120 MPH. I’ve touched 121. My accuracy is horrible so my hope for the sticks are that they will get my muscle memory used to swinging hard which will in turn help me generate better contact. Also—they are a great workout. The first four weeks in the protocol are 40 ish swings. The next 15 or so weeks are roughly 65 swings. These are full speed, aggressive, swings with different weighted sticks, some heavier than your driver some lighter—but your speed is like 50% more than your regular driver swing and you can really feel it in your hands, forarmsm and upper body. I plan on doing full plans over the winter this year. I am 38.. Single high handicap… swing speeds near 100… avg drive in the 270ish range. 40 years old, April HDCP 5.7, original driver swing speed sat comfortably around 101, enjoys long walks on the beach. I purchased the swing radar (must have) with the system so I could track my progress. I have kept track of of my top swing for each of the 21 swing ‘stations’ (RH light club, LH light club, RH middle, etc.) from each session. My original goal was to use SuperSpeed every other day; however that is a tough task for a normal working dude with a family. It’s only about 15-30 minutes, but it’s a surprising workout… you’re gonna sweat and need a shower. I ended up averaging 2-3 sessions per week for three months. My results have been very similar to the training cycles chart above, just a bit different in timing. I had my first increase (~3%) after the very first session and the second in the 6th session, which was another ~3%. I attribute not getting it all at once to the fact that I almost always do SuperSpeed after my normal gym workout so I’m a bit tired. The initial jump is significant and noticeable, not just on a monitor but on the course with ball flight. I had a couple of “woah!” moments from buddies in the first few rounds after this stage. That said, the big drives were not consistent at this stage, more of a twice a round type situation. My second jump came a bit earlier than shown in the training cycle chart, for me it was after the third session in level two, when you’ve begun the kneeling swings (total of around 20 sessions and about 8 weeks). This jump was just a pronounced as the first, gaining another ~4-5%. It was also around this time, maybe a bit before, that I started to see consistency out of the distance with every driver swing, not just a couple per round like the first month or so. Unfortunately, I had to take a break from SuperSpeed speed after the end of July due to an unrelated injury (biceps tendinitis, arm swelled up, I looked like a fiddler crab, don’t worry… I’ll be fine). If I was 25 I probably wouldn’t have stopped, but at 40 I don’t mess with injuries. I will pick back up on the program in the next week or so. Overall, I have been ecstatic about my purchase. I have seen a consistent increase which peaked at about 12 MPH and has stayed at 9MPH even though I haven’t been doing the system in the last few months. As often as we hear that every new driver is going to give you an extra 10MPH, adding this type of swing speed may not seem like much, but it has changed the way I can approach a ton of shots/holes. My home course plays at 6600-7000 depending on tees we choose to play… I just can’t emphasize enough how much more often I have a wedge in my hands instead of an 8-iron, or an iron look at a 520-yard par 5 instead of a hybrid or lay-up. I can carry trouble now in areas I never would have considered before. I’ve had two playing partners purchase SuperSpeed based only on seeing the difference in my distance, and everyone I play with comments on it. Updated profile: Still 40 years old. My last trackman swing speeds (last week) were consistently around 109 without over swinging. Current HDCP 2.4. The 3 stroke handicap drop is at least half due to playing like crap all last winter, but I would anecdotally attribute at least 1-1.5 strokes to SuperSpeed. Is there a 100% money back guarantee? Will this system work for me being over 70 years of age. My driver distance is about 230 yards and I would like to get it back to where it was when I was 50. My 3-wood only goes to about 205 yards. My 7 iron distance has dropped down to 150 yards. What distance increase with those clubs can you guarantee? I’m sure there is some sort of return policy. But no one is going to guarantee anything specific on this forum. Furthermore a company that is so based in science certainly wont guarantee any specific numbers either! The biggest misconception about improving yourself as an athlete is the age variable. Is a teenager likely to see massive gains? Yes, due to puberty, growth, etc. But they were going to make big gains anyway, seniors are losing strength daily. You’ve lost a lot from 50 to 70, you’re going to lose more from 70-80+ unless you do something about it. You’re gains might be minimal (maybe significant) but compared to the loss you’re going to see without training, they’ll be massive. I purchased superspeed 2-years ago. No doubt that it can help improve club head speed. However, it can also create swing mechanic problems if not properly used. Most notably, there is not any club face awareness with Superspeed. The golfer is simply swinging a shaft as fast as possible – similar to a baseball bat. The incorrect pursuit of lag to maximize club head swing can lead to a club face that is too open at impact. Again, I think Superspeed is a great product to improve club head speed — but can the golfer needs to give attention to proper swing mechanics while following the Superspeed training protocol. Our goal at SuperSpeed has always been to help golfers create more swing speed. In this process, different players with different skill levels may have to practice some other aspects of the game in order to optimize their overall performance. Players who tend to sequence poorly in the swing, like those that tend to hit big fades or slices, have probably never learned to properly control the club face into impact. These players typically have a very open face throughout the swing and the hitting area. We find that once the rotational sequencing of the swing improves, the issue with the open face becomes more apparent for some of these players. Face control is a skill that we recommend all golfers practice as this will improve many aspects of ball flight and control. We don’t have a club face on purpose. We want players to break through many of the technical road blocks causing them to swing slower. We are promoting that golfers become more athletic and optimize energy transfer throughout the motion. For players that haven’t done this before, some additional skill practice is very important to take full advantage of their new found power. Great article and case study. Would be nice to see similar examples from consumers who are “regular golfers” and not someone whose job is playing golf or under 30 and athletic already. Give me an out of shape 45 y/o with a job, married with kids, and plays once a week. I feel like this is an even better example of how impressive this is. This guy has been training for years and saw minimal increases in His speed and within six months made colossal gains. Think about how big the gains would be if this was a guy that did nothing at all. As we all know its easier to go from a hundred stroke average down to a ninety average, while going from seventy five to sixty five is significantly more difficult. The other thing about this training aid is you don’t have to be at the course. You can come home fire up the grill and do the training while cooking. If you go on WRX there are long threads of guys that have gotten huge increases…. the key is to by a swing speed radar and track yourself.. It forces you to swing harder seeing the numbers. If you’re totally untrained, and completely commit to the program, you’ll see great results. Look up “the novice effect” and then take advantage of it. Hi Steve, most often tour players are already close to maximizing many of the extra benefits that amateurs see from SuperSpeed training. These being improved ground mechanics, sequencing and lag which are all big power generators. This means that it can be harder to get speed increases with them and the gains might not be as large. For the standard amateur player in your example we will on average a 5% increase in speed after the first 6 weeks and then further gains if the player continues the training protocols. We have worked with thousands of these types of players and see the same results over and over. Hi, the kinematic graphs are in the correct order in the article.